Pike/Pine: National Gallery of Art - Washington, D.C.
DC was woefully uncooperative during this trip; this was the only photo I took for three days! But this gentleman certainly stood out. He looked so perfectly elegant reading his book by a garden in the National Gallery. Hi style scount - Thanks! & great site! We in DC are trying to change--although it might be hard to find, there are some of us out there who do LOVE fashion. Next time you come hopefully we'll help you out a little more!! 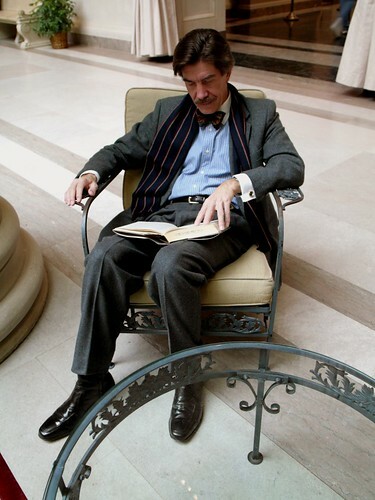 At first glance, I was worried that the only stylish person you snapped in DC was.... Geraldo Rivera! So happy to be wrong about that. Sooo sartorial. It's hard to believe such sophistication really exists. The NGA! I wish I had been there when you were in town! I'm with ladybug. Fun people in DC really do exist! You're right! He's not Geraldo. The guy's a Washington, D.C. legend, but a total mystery. I saw him once at a party at the home of the ambassador from the European Union. My wife heard he's a diplomat and wicked smart, perhaps a patron of the Gallery. Hi charles - Unfortunately I don't! He was exceedingly polite, but rather surprised/skeptical at first when I asked to take his picture. But afterward, he said very amiably, "Good luck to you!" He's also the first person I've photographed who's asked if I had a card - rather charmingly old-fashioned. Unfortunately I had none on me that day. Let me know if you get to the bottom of this mystery. Regardless, I'm glad to hear he's as fascinating as he looks. jas, this is my favorite photo. i love the contrast: his look, so carefully put together ...and yet the way he sits is so careless. lovely! Amazing, he looks just like Geraldo!